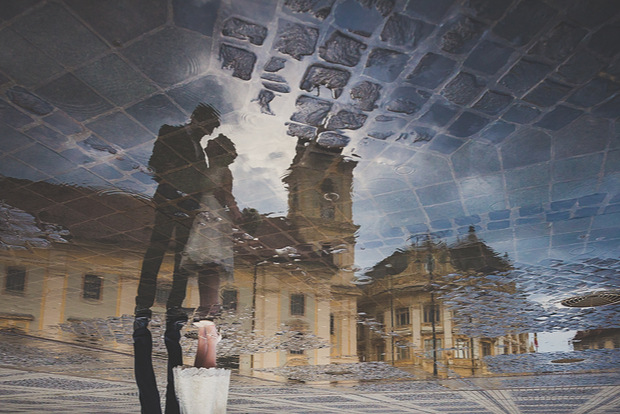 Are you prepared for rain at your next wedding shoot? As a photographer, you should be ready for any situation. In this guide, we will share 7 tips for shooting a wedding when it rains. You never know when it might rain at your outdoor wedding shoot. However, you can prepare yourself to avoid panic and capture amazing photos in the rain. 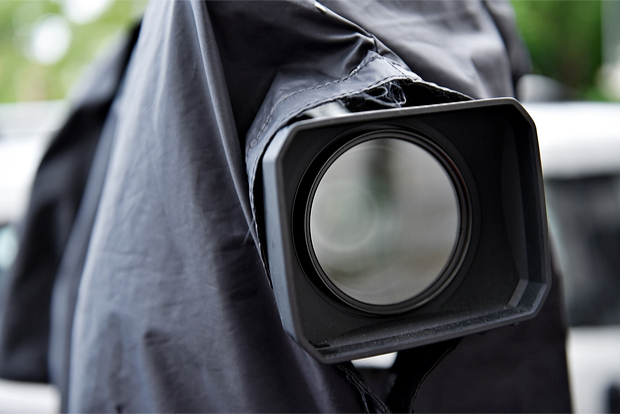 Many of the new professional cameras, lenses, strobes, flash, and other electronic photography gear have weather protection shields. However, it is safest to carry a few waterproof plastic bags with you if there’s a chance of rain. Use these waterproof bags for outdoor shoots in rain. Also, there are fitted plastic bags available for cameras and lenses. Rain may leave reflective puddles that are perfect opportunities for beautiful shots. Rather than trying to fight the rain, use it to your advantage! Experiment with different camera angles, and try a wide-angle lens for capturing gorgeous reflections in the water. When it starts to rain, you’ll need to check your shutter speed and ISO settings. Since the dark clouds will dim the natural light, you should raise the ISO to make your lens more sensitive to light. To catch the raindrops suspended in the air, try increasing your shutter speed to 1/500th of a second or more. You may find that the sudden rain causes a panic situation for your clients. You’ll need to remain calm, and assure the bride and groom that everything is fine and you can still capture amazing photos. In fact, the rain will make your photos even more beautiful! Be patient and keep a positive attitude. If you are relaxed, then your clients will relax as well. Find cover to keep the couple dry. A building overhang, an awning, a porch or even a tree will do. 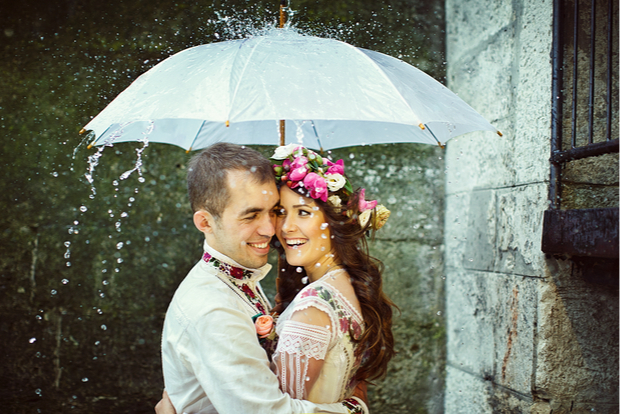 If you have an assistant, you can have them use an umbrella or a reflector to shield the couple from the rain. You should also be prepared with towels and plastic bags, in case you can’t find cover quickly enough. The towels can be used to dry your gear off afterwards, and the plastic bags can be used to shield your camera or to provide a dry spot for the couple to sit on. 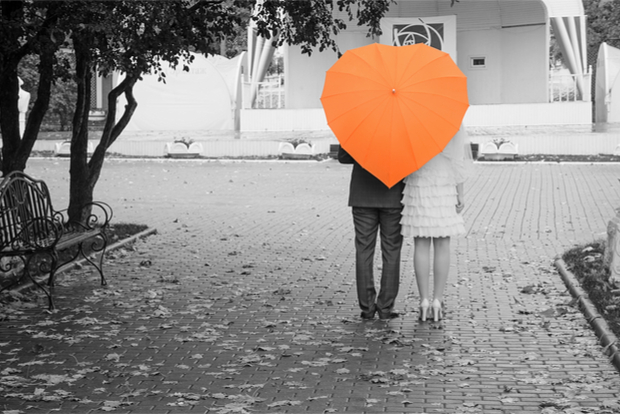 Umbrellas can make for great props, and really bring life to your photos. Remember that the rain is part of your clients’ wedding day too… include it wholeheartedly in their story, and have fun with it! Just be careful that the umbrella isn’t putting your clients’ faces in too much shadow. If you think to bring umbrellas with you beforehand, try a clear umbrella which will allow light to shine through. Also, it’s good to have an assistant with you to hold another umbrella over you while you take the shot. While shooting in rain and cloudy weather, it can be tough to find enough natural light. However, the rain itself can be a wonderful reflector. Look for areas where the light is bouncing off of the rain and use it to light your clients’ faces. You may also notice rain drops pouring from the umbrella, leaflets, or other props that can add beautiful details to your shots. You may even find that colors are more vibrant in the rain. So don’t worry if it starts to pour down during your shoot– the rain is not your enemy. Embrace it, and you’ll have gorgeous photos you can be proud of! We hope this tutorial has helped you to learn 7 tips for shooting a wedding when it rains. You may also want to check out our guide on 43 Photoshop Actions for Wedding Photographers. If you like this tutorial, then please follow us on Facebook and Twitter for more photography tips and resources.